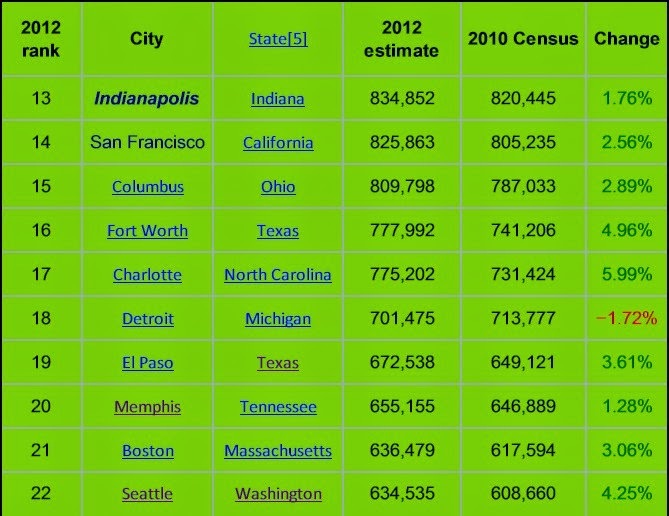 What either the Detroit Free Press or Detroit News needs to do is select four cities from the chart below and compare Detroit's proposed budget to these cities. There will be major differences because of the bankruptcy but it will help the city's citizens understand what they are in for. From my perspective Detroit's budget looks like it takes the city from a near death experience and puts it on life support. That is not good enough. The citizens deserve to see a plan that promises a future and it must utilize existing assets to make it happen. The assets I have in mind are located in the DIA. After all, what is a chapter 9 bankruptcy all about; to make the future brighter for the city and its residents. Email Stephen Henderson at the Free Press or Nolan Finley at the Detroit News asking them to do the analysis. The citizens of Detroit have a right to see their future and have a say in it. They are the biggest stakeholders in the bankruptcy.